So let’s start with your starting salary. 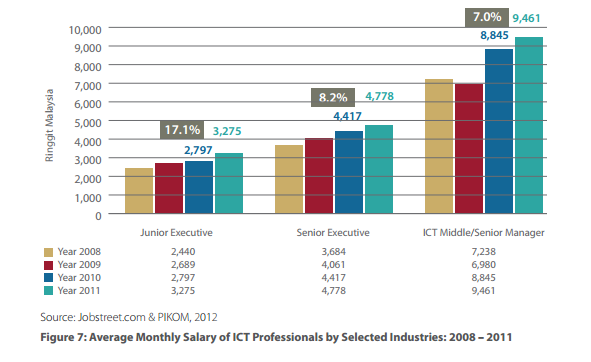 According to the same JobStreet/Pikom report the Mean starting salary for an IT Professional is Rm2,238 with a high of Rm3,280. Now of course not all IT Professionals come from an IT degree, some may come from Engineering degree or even design, but the basic takeaway is that an IT Professional’s starting salary in Malaysia is not much lower than that of an Engineer and you spend 1 less year in University which is neither bad nor good–but cheaper. Also, it’s good to take note that while there is variation across the industries, most industry pay around the median–so a starting salary of between Rm2,000 to RM2,500 is the norm and that’s pretty good (only those kiam sap fellas in construction pay Rm1,800). I know for a fact, that the starting salary of an IT professional in the Oil and Gas industry these days hover around Rm4,500 and it’s the same for IT professionals in the consulting industry as well. The fact that the starting salary for an IT position is as high as an engineering position reflects the growing demand and appreciation of IT skills in Malaysia. Of course, not all IT positions are filled by IT graduates, they could come from Engineering, Design or just about anywhere else. My first job was in IT, but I came from an Electronics Engineering background, the point isn’t your degree–it’s your first job. IT rocks as a career–so choose it–regardless of your degree. 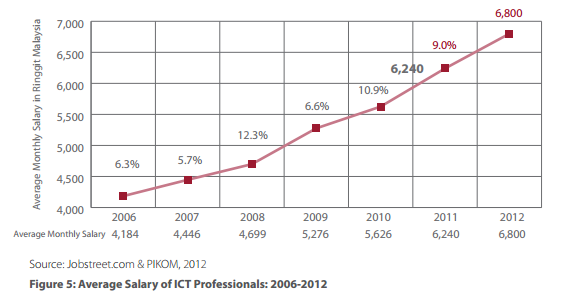 IT professionals have seen a marked increase in their pay packages with a more than 50% increase since 2006. Imagine getting a 50% pay increase over 5 years–not bad huh! Not only are we getting good starting salaries, we’re continually trending towards higher pay. Now this makes sense to a certain degree, if there are less IT graduates to go around then it’s a simple matter of supply and demand. However, I would make the case that it’s more a matter of demand for Good IT professionals increasing, thereby creating competition in the job market for skilled IT professionals and that competition translates to higher salaries. The salary may sound attractive, but it’s important to note that it’s not just the salary that’s important. It’s the indication that the demand for IT professionals is increasing and with the supply of new IT graduates remaining constant–that’s a good job market to join. So based on just the past two reasons alone, we know for a fact that the jobmarket for IT professionals is glowing red hot, but how about things like long term career advancement which is probably more important than your starting or current pay. Nobody looks to join an industry to remain a Junior Executive for long, and the good news is that when we zoom into the salary increases we see it across all experience levels, from Junior executive to Senior Manager. With Senior Managers earning 30% more than they did just 4 years ago. Once again the focus isn’t on the pay rise itself, but rather the fact that it occurs for all experience levels within the industry. Those pay rises are usually a result of a growing competence and skill set, which means that there is a lot of room for you to grow in IT professionally and employers are willing to pay you for when you eventually do exhibit growth. This is fundamentally important–a good career progression is the single most important criteria for choosing a career since it can either make or break your happiness levels in your job. People who are challenged at work to progress in their careers and usually happier than people at dead-end jobs. IT offers job mobility like no other job function. SAP professionals work on multiple industries including Oil & Gas, Automotive, Banking and even Telco, and just like SAP there are hundreds of IT systems where core IT skills are required over industry domain experience. What that means is that a good IT Project Manager can transfer his skills across industries (Industry experience still counts of course), but not as much as Industry experience in a Engineering line. That greater mobility allows IT professionals to move freely across organizations gaining valuable skills and experience, but also for them to avoid certain cyclical industries like the Automotive and Semiconductor sectors. These sectors experience some turmoil during the down-turns and most of their staff stay on because their skills aren’t as transferable or mobile across industries–and that’s why IT rocks. An engineering in the semiconductor industry, is stuck in it, and if there’s a down-turn very few industry players would be hiring anyone. IT graduates almost completely avoid this problem–almost. From a personal perspective, my skills aren’t transferable to most other industry, as I sit in the boundary between business and IT, but it’s the exception and not the norm. 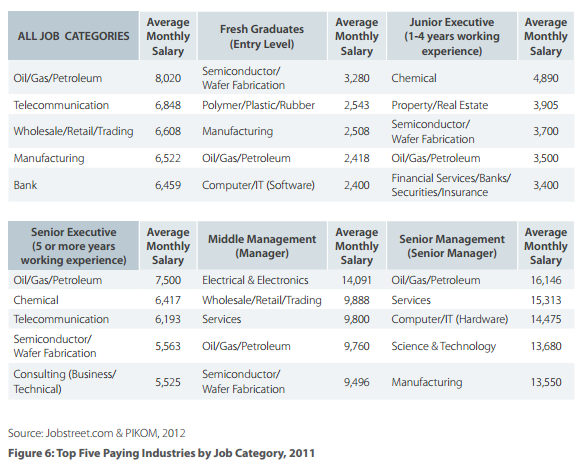 Of course to backup my theory, all you have to do is to look at the Salaries of IT professionals at the Senior Manager level across industries, they range well into the 5 figures and they don’t differ by much. Some industries (like telco and banking) still insist on Industry experience for IT professionals, but in most cases are willing to take a chance on IT professionals with solid IT skills when presented with one. In fact, it’s because IT skills are so fluid across industries, that the pure IT companies (like IBM and Microsoft) experience little to no cyclical effects. Increased demand from one Industry can offset decreased demand from another, and the same report from Jobstreet also points to the fact that the IT pay package has almost no difference between the IT providers and the IT users. Of course, pay differs by geographical area, but in Malaysia and specifically in the Klang Valley, Penang and Johor there doesn’t seem to be a huge variation in pay. Good news for people in Johor or Penang who wish to work closer to home–it means you can do so without sacrificing your pay. Sure Johoreans get paid about 7% less, but that doesn’t take into account the cost of living. Not the mention that the same mobility in IT allows you to ply your trade not just in the different states in Malaysia but across the causeway and beyond as well. Singapore has a thriving IT job market, and Australia has a whole list of IT jobs they need filled. Who wouldn’t want to triple their pay by moving to Australia–and IT allows you to do that. To be realistic though, most of the IT infrastructure is in the Klang Valley. Banks run their IT operations from the Klang Valley, not Johor, and no Telco I know of has an IT arm in Sabah–so to really grow your IT skills, particularly in the big companies–you’ll need to move to KL. The takeaway though is that it’s possible to still have a solid paying IT job in Johor or Penang. *don’t pay too much attention to the graph, the scale doesn’t start at 0, and hence the percentages are not visually accurate. A 7.6% differential from Klang valley to Johor is absolutely nothing. When you think of an exciting career, you might think of building a Space Station for NASA, or designing the next BMW 3-series, to a certain extent that’s possible–but not in Malaysia (and that’s the truth for the foreseeable future). What’s possible though is that you become part of team that is building the next big system, that you become an early adopter of a cloud computing, or release an app that fundamentally changes the power grid–these things are possible because unlike engineering challenges, IT challenges usually occur without boundaries. That’s one of the great thrills of my job, unlike engineering and even business–IT projects can be delivered across the globe which makes Malaysia a great nesting ground for IT projects. Not wanting to get all sentimental, but if you really want to give back to Malaysia–become and IT professional, or and engineer. Or like me, you should do both. Engineers and IT pros are like Satay Kajang–you can never have more than enough. Never, ever, EVER– become a politician, a lawyer or a banker. The world has enough scum, and we don’t need additional politicians or lawyers or bankers to transform Malaysia–we need more technical people. As a country, we desperately need more technology, not more laws of financial products. I still can’t understand, given just the salary progression of IT professional, the increased opportunities to grow competencies and skill sets in the Industry and the general trend globally–WHY AREN’T MORE MALAYSIANS REGISTERING FOR IT COURSES? Why don’t we have more IT graduates? What’s happening, there must clearly be a disconnect somewhere, that while the industry is thriving in Malaysia–less and less young people seem willing to take up IT. I don’t understand, this generation of kids we have today are the ones that will take over this country someday, and yet with all their IT-Savvyness their not willing to pursue IT as a career. Something needs to be done. I chose the wrong course (Mechanical Engineering) when I did my diploma. I soon realized how big the opportunities there is in IT, it’s mind blowing. Hopefully I’m not too late in pursuing my degree in IT (Another 5 years at OUM). Indeed IT rocks!! Hey Ashrufzz, I don’t have an IT degree either. It’s quite common to see engineering degree holders in IT position but not the other way around. What I suggest is to complete your degree in engineering and then pursue a career in IT. IT is awesome man. I love my job, and hopefully you find something you love as well. I think more Malaysians like science subjects more than computer studies. In my university only about 25% of our science majors are taking computer science and the rest are pursuing biology, chemistry and psychology related subjects. And it’s perfectly normal even where I come from parents emphasize their children to be doctors, pilots and other jobs that seem prestigious on the outside. Malaysian IT market is rising day by day and every people want to work with Malaysian software companies which is pretty good for Malaysia economics. Does having a bachelor degree in Multimedia is considered IT related courses? Man I’m confused what I want to further for my degree. But if the trend is getting better for IT, then I might have to continue studying in multimedia field. In fact, I already have my diploma in multimedia so everything should be okay. The only thing I hate is the programming subjects, it is by far the hardest subjects for me while studying multimedia. there’s a great market for good web designers as well. and if you’ve got artistic talent–why not? May I know any differences between degree in IT and degree in Computer science?